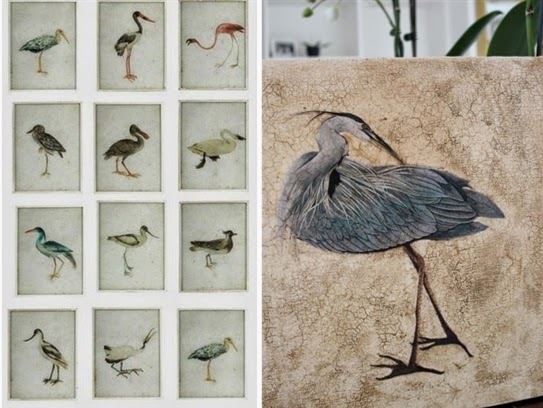 Recently I came across a set of bird paintings and wondered if I could achieve a similar look with decoupage. Using Chalk Paint™ and Annie Sloan's 2 step craqueleur, I set about trying to reproduce the look and have created a tutorial with images to show how easy it can be. You may be familiar with Chalk Paint™ and not realise that Annie Sloan also has a series of products to use for decoupaged furniture, in fact pretty much any kind of material can be decoupaged with her products. Recently I was fortunate to meet Annie Sloan and her Marketing Manager, Charlotte Freeston, on a flying visit to Auckland. I had already attended an advanced decorative course at Le Monde on decoupage, so I spoke to Annie briefly about the possibility of using these products on a canvas as a mixed media. 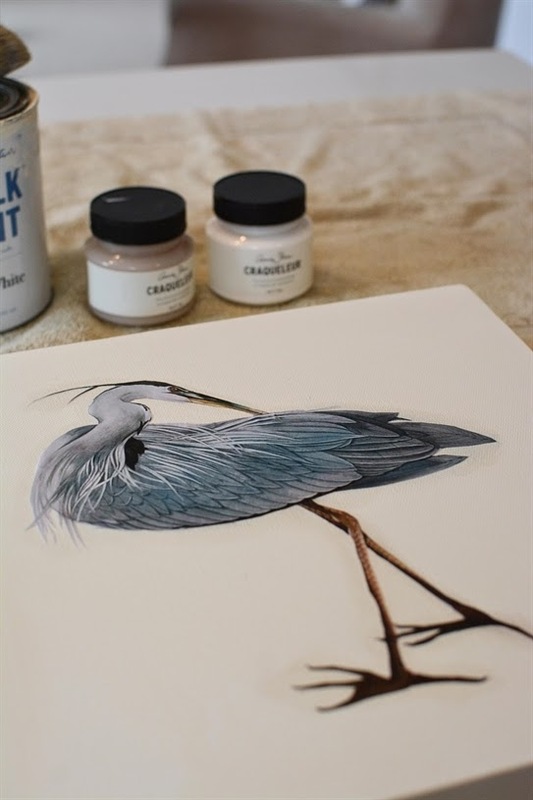 Annie informed me a number of professional artists are already working with her products, so when I saw the Oka birds, I thought they were the perfect project to attempt with Annie's range of products. I downloaded my image from The Graphics Fairy. I chose a bird similar to the ones in the Oka pictures. I also downloaded some shells for a friend who also wanted to try out the technique. Image via The Graphics Fairy. Tip, to search for images on this site, it is easier to go to the tab marked 'categories' as it will bring up far more images than searching a specific subject. Categories are broken down into flowers, birds, shells etc. Above: Plan where you will place your decoupage before you start cutting it out. Paint your canvas your desired colour, I chose Old White. Allow the canvas to dry completely before the next step (2 coats is preferable). While it is drying you can cut out your decoupage. It can look great with a coloured background as seen in the tiles on the in the tutorial I attended at Le Monde. Note: If you are using a full sheet and not cutting around images, there is no need to paint the canvas. The dark wax will tint the background when applied. Above: Using a fine craft knife, cut carefully around your image. It is nice if you can achieve some fine detail as I did with the lower feathers. Hint: If you use a pair of scissors and let the paper do the work you will achieve a finer edge. Above: Reverse your decoupage, pasting the back with the decoupage glue with an acrylic flat brush. 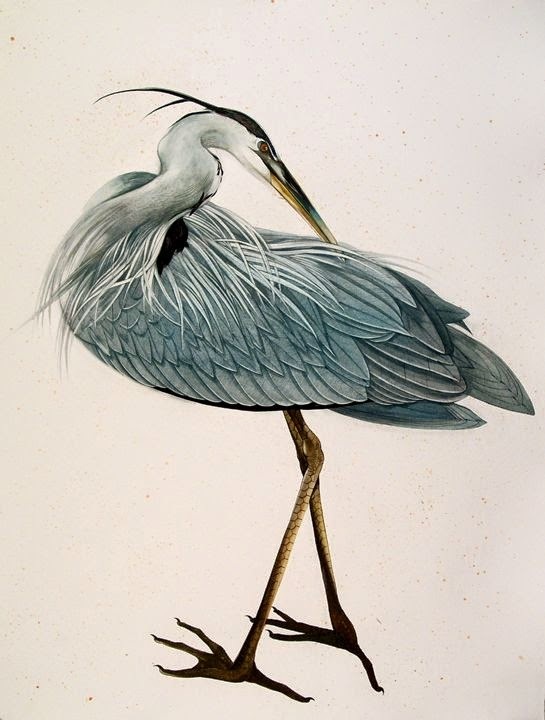 It is advisable to paste the canvas or furniture you are placing it on not the paper, however, this is difficult with a fine piece like this bird. I found I needed to work quickly as it dries very quickly in a warm environment and I had the heating on. Above: Quickly place your decoupage onto your canvas, make sure it is perfectly placed then press down to make sure it is sticking everywhere. If it is lifting slightly, lift that area very carefully and apply more glue. Allow 10 minutes for it to dry (use a hair dryer if you wish). Note: The glue is also a varnish and will dry clear so you can paste gently under and over the edges if they begin to lift. If you are not requiring a crackled effect you could simply use several thin layers of the glue to seal the entire piece. Above: Apply your first coat of 'part 1' of the (2 part) craqueleur with a brush - This should completely cover the canvas and the decoupage. Allow it to dry completely (you can use a hairdryer to speed up this step). Above: Once completely dry, apply part 2 of the craqueleur process with a medium size 1" acrylic flat brush. You can use a hair dryer to speed up the drying time. If the cracking is not enough, once dry apply another layer of the second coat. Make sure you coat the complete canvas, not just the cut out you are using. Above: If you look carefully you can see the cracking of the craqueleur. You do not want to apply any wax until you have cracking over all of your canvas, including the decoupage. I found that my first layer didn't crack very well so I applied another coat of part 2 of the process, making sure it was a thicker layer. I find the thicker layers seem to crack better and again you can use a hair-dryer to speed up this process. Note: Do not apply it too thickly. Above: Close up of the craqueleur effect with the dark wax applied. Hint: I was in a slight rush with this project and as you can see by the birds crest I didn't cut close enough to the black lines. However, I could have used a dark, permanent marker to fill in the gaps. You do want to get as close as possible though to the edge to achieve a seamless finish. Above: Applying the dark wax. I had a friend around to teach her how to use the decoupage technique on canvas. Kathy chose some shells printed over an old map. This technique would be perfect to give the print an antique look. Applying Annie's Dark Wax with a brush will get into the cracks better than using a cloth. However, we chose to use a soft cloth to rub the wax into the crevices in a circular motion. Once the wax is applied to the crackled effect, it magically comes to life. Above: Once your layer of wax is dry (about one hour), apply one coat of clear wax. Allow the clear wax to dry until the 'tack' has gone. Using a clean soft cotton (lint free) cloth, start to buff in a circular motion until you have a slight sheen. You can apply another layer of wax once the first layer of clear is dry. The clear wax adds further protection. 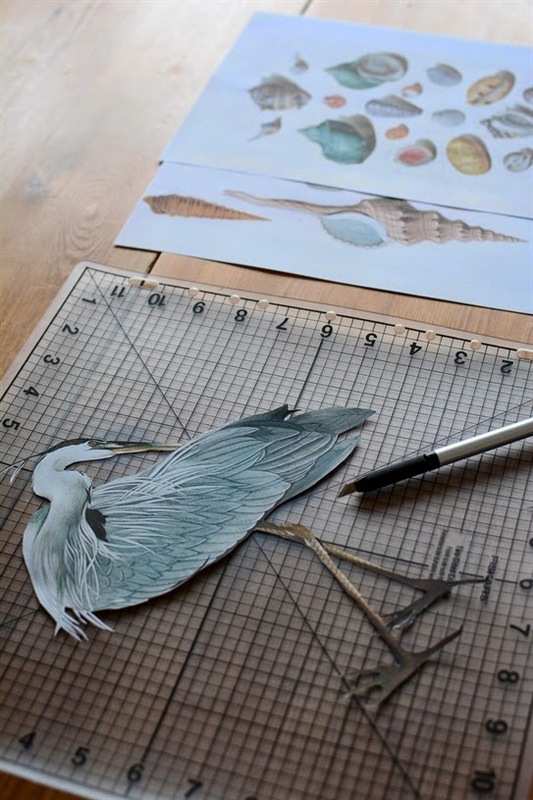 Above: Kathy's completed work - The shell image was found on Pinterest and required little cutting out as Kathy wanted to retain the antique map in the background. 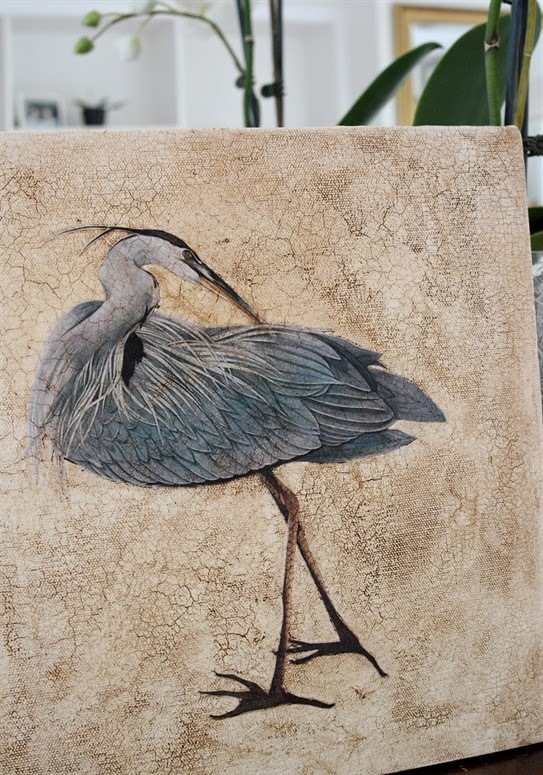 Kathy simply glued the A4 Sheet directly on the canvas, leaving a border either side. I was pleased with the results of both pieces and I hope you found this tutorial inspiring enough to attempt something yourself. This method can be used on canvas, wood,furniture in fact most surfaces. You can use images from books, magazines, or a downloaded image printed onto A4 photocopy paper, as above. For my next project, a friend of mine has a beautiful antique side table, decorated in decoupage and gilding, I am on the lookout for a similar shaped table to mimic the idea using a slightly more advanced decoupage technique with gilding. You can learn these techniques first hand, at the courses currently being run at Le Monde (see link above). Awesome! What a beautiful finish the wax gives to the canvas. Can't wait to try this. Thanks Peggy, yes definitely have a go and if you need any more advice, please don't hesitate to email me. This is beautiful! You may have given me an idea for some wall art. Thanks so much for the inspiration! So pleased you have been inspired Danielle. If you don't have the dark wax you could use an acrylic paint in 'burnt umber', rub it into the crevices of the crackle but wipe it off the rest of the canvas so it only shows in the crackle. You may have to use a slow drying medium in it so that you can do this. It is just a thought and something I might try next time. You could then seal with a couple of coats of the glue/varnish from Annie's range. Thanks for taking time to comment Anna, it is a simple technique, I wish you well with your project. Wow, so much to say here. First, I love when I open a blog and it's new to me. So much promise of new treasures... :-) (I'm new to blogging, so many of the blogs are new to me.) Second, as an artist, I've never thought of my projects as DIY, but I'm inspired to start a Pinterest board to bookmark some of the projects I've seen today and this one is at the top of the list. Finally, one question - what kind of paper are you printing you image on to start with? I assume you are using an oversized printer? Your bird came out so lovely!! Thanks for sharing this! Thanks for commenting Lory. I have looked at your blog, its gorgeous, I love the layout and simplicity. I am an artist too (you can see my work on the tab at the top of my website). I would never consider my oil paintings as DIY :). I only used this term for this project as it was something anyone could achieve, no need for art skills to reproduce something like this. I am really pleased you enjoyed the tutorial. With regards to the paper, it is just ordinary photocopy paper printed out of a deskjet printer (home one) not a large printer at all. I printed the image onto A4. If you wanted a larger image, then I would suggest you print it out on A4 and take it into a photocopy centre where they can blow it up without it becoming too pixelated. I wasn't 100% happy with my bird but know where I have to change things next time so hope you can visit again for a new project as I am going to explore this technique a little more but add some more interest to it. Hi, yes any ready to use canvas will do, cotton duck is fine which is the cheapest type of canvas. Oh wow, this is so beautiful and such a great technique. I love both pieces. Thanks Marty, very easy to do and I have a great idea for next time. Thanks Jane, I am sure you could do a really good job. I am going to do a small series of four prints in a different subject next time. I have an idea to make them look much better. If you attempt a project, please send me some images. Amazing job! 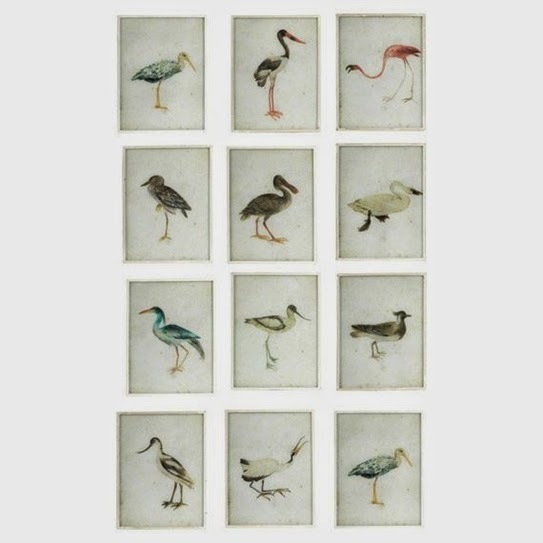 These look so chic, I love the bird piece. Thanks for the new project idea. Thanks Nicole, a simple technique that can be applied to any subject matter. I will be tackling a new project next month. I am so sorry seeing your reply so late Rachelle. I imagine you have finished your project by now. I am not sure about shoe polish but I imagine that it is possible to use a clear beeswax shoe polish (possibly). The thing about Annie Sloan wax is that it dries hard and you can buff it up. Once again sorry for late response, somehow you slipped into my spam comments which I am wading through. Oops I realise I already replied in detail below. Hi, Shoe polish is designed for leather not wood and would not form the hard, protective coating that the Annie Sloan wax does. Also there are harmful chemicals in shoe wax. By "regular wax" are you meaning wax furniture polish like bees wax? If you are, yes I would say that it would do the same thing. The main reason for the wax is to protect the paint and give a nice sheen and not a flat finish which you would have if you didn't wax. Hope this helps.